This is your morning viagra super active online canadian pharmacy Open Thread. Pour your favorite beverage and review the past and comment on the future. Find the past see “On This Day in History” here. April 12 is the 102nd day of the year (103rd in leap years) in the Gregorian calendar. There are 263 days remaining until the end of the year. After his historic feat was announced, the attractive and unassuming Gagarin became an instant worldwide celebrity. He was awarded the Order of Lenin and given the title of Hero of the Soviet Union. Monuments were raised to him across the Soviet Union and streets renamed in his honor. The triumph of the Soviet space program in putting the first man into space was a great blow to the United States, which had scheduled its first space flight for May 1961. Moreover, Gagarin had orbited Earth, a feat that eluded the U.S. space program until February 1962, when astronaut John Glenn made three orbits in Friendship 7. By that time, the Soviet Union had already made another leap ahead in the “space race” with the August 1961 flight of cosmonaut Gherman Titov in Vostok 2. Titov made 17 orbits and spent more than 25 hours in space. 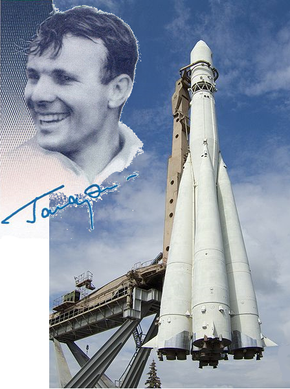 Today is the 50th Anniversary of Yuri Gagarin’s Flight into space. ‘Moon Shot’ recounts cosmonaut Yuri Gagarin’s history-making orbital trip in 1961. MSNBC Science Editor Alan Boyle recaps Yuri Gagarin’s historic space mission, as shown in a Soviet documentary video. http://cinziamazzamakeup.com/?x=viagra-generico-100-mg-spedizione-veloce-a-Milano 238 – Gordian II lost the Battle of Carthage against the Numidian forces loyal to Maximinus Thrax and is killed. Gordian I, his father, commits suicide. http://cinziamazzamakeup.com/?x=levitra-generico-Veneto 467 – Anthemius is elevated to Emperor of the Western Roman Empire. generic viagra super active usa 1204 – The Crusaders of the Fourth Crusade breach the walls of Constantinople and enter the city, which they completely occupy the following day. http://cinziamazzamakeup.com/?x=comprare-viagra-generico-25-mg-spedizione-veloce-a-Parma 1557 – Cuenca is founded in Ecuador. http://maientertainmentlaw.com/?search=brand-cialis-sales 1606 – The Union Flag is adopted as the flag of Great Britain. dove acquistare viagra generico 100 mg a Bologna 1633 – The formal inquest of Galileo Galilei by the Inquisition begins. http://maientertainmentlaw.com/?search=reputable-place-to-buy-accutane 1776 – American Revolution: With the Halifax Resolves, the North Carolina Provincial Congress authorizes its Congressional delegation to vote for independence from Britain. 1820 – Alexander Ypsilantis is declared leader of Filiki Eteria, a secret organization to overthrow Ottoman rule over Greece. 1831 – Soldiers marching on the Broughton Suspension Bridge in Manchester, England cause it to collapse. 1861 – American Civil War: The war begins with Confederate forces firing on Fort Sumter, in the harbor of Charleston, South Carolina. 1862 – American Civil War: The Andrews Raid (the Great Locomotive Chase) occurred, starting from Big Shanty (now Kennesaw), Georgia. 1864 – American Civil War: The Fort Pillow massacre: Confederate forces kill most of the African American soldiers that surrendered at Fort Pillow, Tennessee. 1910 – The SMS Zrinyi, one of the last pre-dreadnoughts built by the Austro-Hungarian Navy, is launched. 1917 – World War I: Canadian forces successfully complete the taking of Vimy Ridge from the Germans. 1927 – April 12 Incident: Chiang Kai-shek orders the Communist Party of China members executed in Shanghai, ending the First United Front. 1934 – The strongest surface wind gust in the world at 231 mph, is measured on the summit of Mount Washington, New Hampshire. 1934 – The U.S. Auto-Lite Strike begins, culminating in a five-day melee between Ohio National Guard troops and 6,000 strikers and picketers. 1935 – First flight of the Bristol Blenheim. 1937 – Sir Frank Whittle ground-tests the first jet engine designed to power an aircraft, at Rugby, England. 1945 – U.S. President Franklin D. Roosevelt dies while in office; vice-president Harry Truman is sworn in as the 33rd President. 1954 – Bill Haley & His Comets record “Rock Around the Clock” in New York City. 1955 – The polio vaccine, developed by Dr. Jonas Salk, is declared safe and effective. 1961 – The Russian (Soviet) cosmonaut Yuri Gagarin becomes the first human to travel into outer space and perform the first manned orbital fly, in Vostok 3KA-2 (Vostok 1). 1963 – The Soviet nuclear powered submarine K-33 collides with the Finnish merchant vessel M/S Finnclipper in the Danish straits. 1968 – Nerve gas accident at Skull Valley, Utah. 1970 – Soviet submarine K-8, carrying four nuclear torpedoes, sinks in the Bay of Biscay four days after a fire on board. 1980 – Samuel Doe takes control of Liberia in a coup d’état, ending over 130 years of national democratic presidential succession. 1980 – Terry Fox begins his “Marathon of Hope” at St. John’s, Newfoundland. 1981 – The first launch of a Space Shuttle: Columbia launches on the STS-1 mission. 1990 – Jim Gary’s “Twentieth Century Dinosaurs” exhibition opens at the Smithsonian Institution National Museum of Natural History in Washington, D.C.
1992 – The Euro Disney Resort officially opens with its theme park Euro Disneyland. The resort and its park’s name were subsequently changed to Disneyland Paris. 1994 – Canter & Siegel post the first commercial mass Usenet spam. 1998 – An earthquake in Slovenia, measuring 5.6 on the Richter scale occurs near the town of Bovec. 1999 – US President Bill Clinton is cited for contempt of court for giving “intentionally false statements” in a sexual harassment civil lawsuit. 2009 – Zimbabwe officially abandons the Zimbabwe Dollar as their official currency.